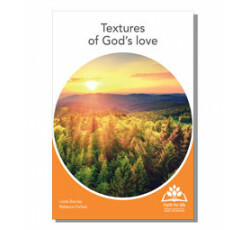 Textures of God's love is part of the Faith for life collection and encourages devotional engagement with God’s love expressed through the Bible and in beautiful photos, familiar textures or objects and prayer. Choose an object to hold or an activity to do. Take time to reflect on a question or thought. The 12 double-sided cards the Textures of God's love series are printed on sturdy, quality art board and specially coated for extra endurance. They come in a polypropylene satchel for safe storage and transport. 'This resource enables people with dementia and those offering support, to hold on to God even when the memory of God can seem elusive and difficult.' Professor John Swinton, award winning author of Demenia: Living in the memories of God. 'I’m really pleased to have a Bible-based resource to help people living with dementia to grow and be encouraged in their spiritual life. The quality of the material is stunning and I can attest to its practicality and usefulness with formal or informal pastoral work. ' HammondCare's Head of Pastoral Care, Rev Andrew Nixon.